In collaboration with school leadership and Polk Virtual School, the Department of Academic Rigor has established twenty middle school Science, Technology, Engineering, Arts, and Mathematics (STEAM) Accelerated Academic Programs. The programs have been rolled out district wide since 2010 with new grade levels being added each successive year. The purpose of STEAM is to provide students with an accelerated academic program of study which utilizes college readiness curriculum and offers the potential for students to earn up to six (6) high school credits prior to entering 9th grade. Completion of these credits at the middle level permits more flexibility within a student’s high school schedule to begin college level coursework (Advanced Placement and/or Dual Enrollment) at an earlier age. In addition, students have the opportunity to explore a wider variety of elective programs as they finish their graduation requirements. The academy’s curriculum focus will include: Science, Technology, Engineering, Arts, and Mathematics (STEAM). Under this broad umbrella, students will learn middle school concepts at accelerated levels, all through the lens of authentic curriculum experiences, problem-based learning methods, and rigorous and relevant assignments. 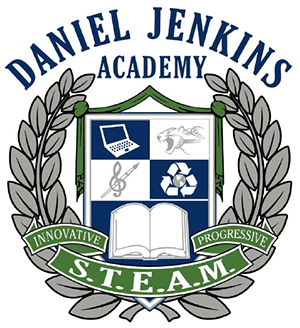 Students at Daniel Jenkins STEAM Academy will gain the skills to enhance their ability to think critically, work cooperatively, solve complex problems, and drive advancements in science and technology. Students will be placed in Advanced courses in Math, Science, Language Arts, Reading, and Social Studies. In addition, to these courses, students enrolled in the STEAM Academy are placed in Beginning Spanish, Environmental Engineering, and/or Advanced Academics for Gifted. Potential for students to earn up to six (6) high school credits prior to entering 9th grade. Provided with opportunities for participation in the co-curricular activities such as Science Fair, History Fair, Technology Student Association Conferences & Competitions (TSA), E-Team Competitions, National Junior Honors Society (NJHS), First Lego League Competitions (FLL), etc. In order to maintain participation in the STEAM accelerated program from year to year, students will be evaluated on an annual basis. The evaluation will include a review of the student’s standardized assessment scores, portfolio work, grades, discipline file, and attendance records. Must participate in a co-curricular activity such as science fair, history fair, E-Team, etc.